Full spectrum dominance, thats the name of the game, the ones in charge, those that makes the comands, dont even hide it. Thats been official USA policy for centurys, not this present years. All the various puppets are dangling around and makes chaos. Consiracy, of course, since the Dawn of men, grups have fighted for Power, a reality, like Tidewawes constant rumble. The goal, justifyes the means, as always. Nothing will ever happen, absolutly nada, before we start to talk about The Real Problem, the one that we all know about, the 800 poud Gorilla in the room, on steroids and boose. Even if Libya try NOW to get rid of NATO’ s lackeys it will be very hard task with a lot of blood and no sure result. 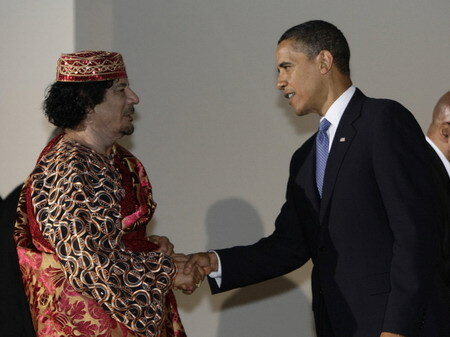 So, there is NOTHING to congratulate Libyan with – except of the same NATO lackeys. Just look to Iraq – are they better off after NATO “freed” them of Saddam? It has been 8 years for Iraq and where they are? What will be of Libya in 8 years? How many more murdered, robbed, drown out? How much more ruins? What is happening in the world is because of the frustration of the majority community of that country. It should be a great lesson to every politician, especially those who are in power. Tolerance has its own limit.